Charles McBride White was born in Kansas City, Missouri, and grew up in southwestern Iowa. He received his BFA from Drake University in Des Moines. His studies included a year in Florence, Italy, and graduate school in Corpus Christi, Texas. In addition to being featured in numerous galleries around the country, he also participates in several of the highest quality art and craft shows. 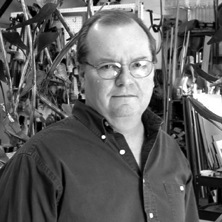 He has received numerous public and private commissions and his work is in public and private collections around the world.